Summer in Palakkad can be frustrating. Soaring mercury, sweaty nights and parched throats. Add to this, the vision of dwindling water levels in the Malampuzha reservoir you have a sure recipe for a disastrous vacation. Taking children to this desolation was immediately ruled out and I had to rack my grey cells to come up with another option. Then the little bulb flickered to life somewhere above my head, and it lit up an elephant! A week before my drive into the 'desert' I had been to a wedding in Guruvayur. 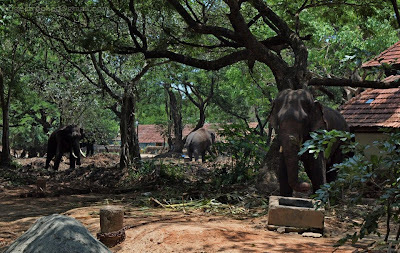 After the usual plantain leaf lunch I had time to kill so I had driven to the Punathur Aanakota, the elephant sanctuary for the temple elephants of Guruvayurappan. I'm yet to come across a child who has not been excited at the sight of an elephant. 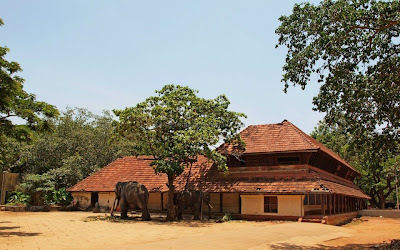 Punathur kotta is a dilapidated royal residence of some local ruler, now converted into a hostel for the elephants of Lord Guruvayurappan and their mahouts. Located three kilometers away from the temple town off (or on) the Kunnamkulam road, (depending on which direction you come from), it is home to some 50 or more elephants mostly majestic tuskers with a few cows. The Lord didn't pay money to buy them obviously. They were donated by devotees with deep pockets who probably wanted to drain the Lord off his treasures. (Thankfully, Padmanabhaswamy in Trivandrun escaped this fate!!). The poor Lord is a mute spectator as someone finds that bringing up a large pachyderm at home is a really unenviable task. Elephant calves are cute but once they grow to about 10 feet high at the shoulders you'll suddenly find yourself cramped for space. Besides, an elephant has a voracious appetite. Feeding an elephant therefore needs a steady flow of hard earned cash and in these days of spiraling prices the cash in hand is usually just about enough to pay the monthly home budget. Just imagine, how much you need to pay for electricity, rents, provisions, school expenses, mobile phone bills, fuel bills, beauty parlour visits, fairness cream & fat reducing oils and so many more indispensable things? Amongst these absolutely necessary expenses where will you find the money to feed your elephant?! So the best solution is to donate it to the Lord of Guruvayur. After all, devotees leave his coffers overflowing everyday. That money has to be spent on useful things and elephants are useful! The Guruvayur Devaswom purchased a 10 acre plot with a palace and temples in 1975 and shifted its elephants there. 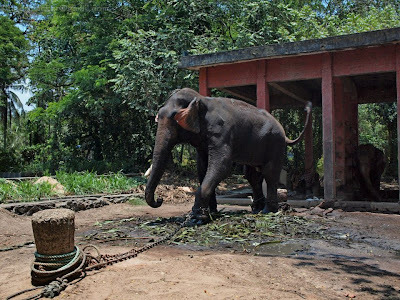 It has since been home to the temple elephants of Guruvayur. The palace, if it can be called that, itself is uninteresting. The tiles are falling off and shows the need for some urgent maintainance. Inside the building there is a central courtyard with a large concrete "charakku", the traditional brass vessel used mainly for making "payasam" and more than enhancing it actually spoils the aesthetic value of the building. The building serves as a place for visitors to rest and vandals to disfigure walls! The Guruvayur Devaswom has in it's custody the single largest collection of elephants outside of the wildlife reserves. As a matter of fact, there are few herds that are 50 strong in our forests and even fewer herds with more than a couple of immature tuskers. 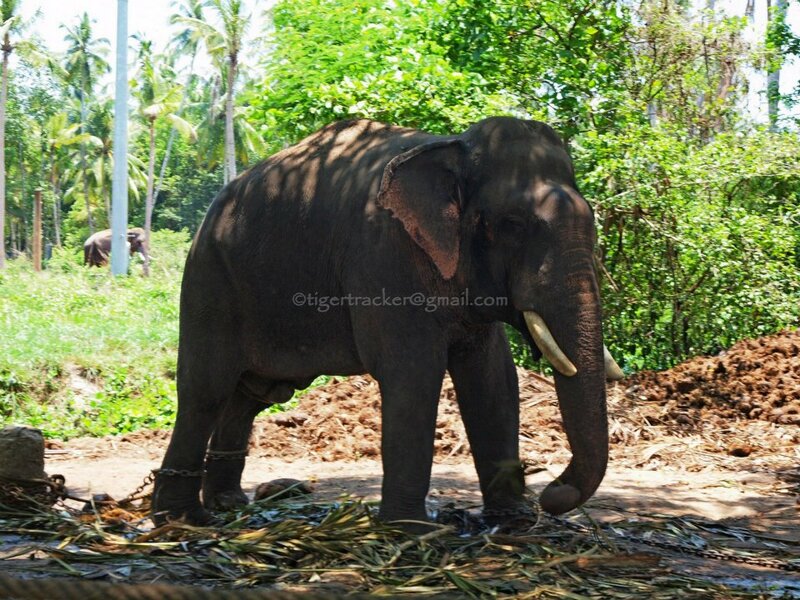 If you want to see tuskers in all their majesty, Guruvayur is the place to see them. The first elephants that greet you are tethered near the parking lot. A few of them have a blue board next to them warning you that the bull is in a state of 'musth'. 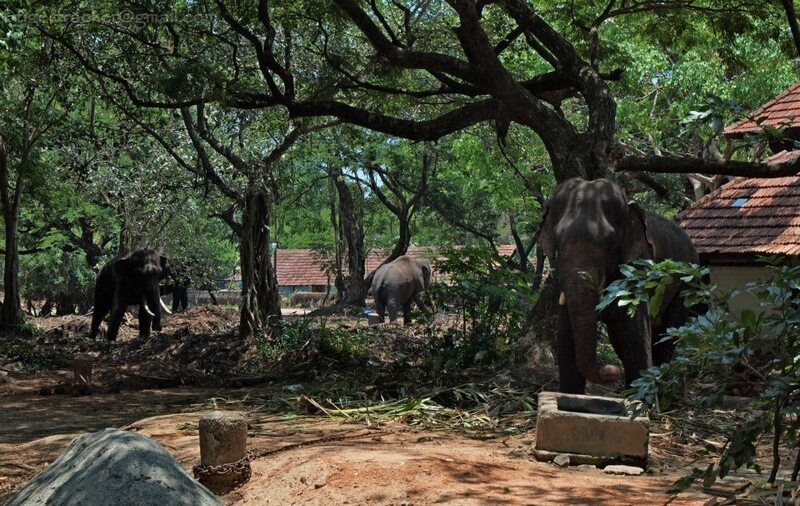 The mahouts keep spraying them with water to cool them off, though I don't see the logic in tethering the beast under a hot sun, and then trying to cool it off! Wouldn't it be better to tie them under one of the large trees instead? On my first visit the number of elephants were half their strength, mostly the old bulls in the twilight of their lives, some in 'musth' and an odd cow elephant. The others were either in the temple at Guruvayur or in surrounding places. It was the season for 'velas', the local temple festivals. Even small temples now line up capraisoned elephants to show of their 'capacity'. It's no wonder that the newspapers are full of stories of elephants running amok all through summer. The elephants in 'musth' are usually isolated because of their unpredicatble behaviour. Some stand docilely chewing on the palm leaves in front of their chained legs. Other are more expressive of their displeasure at not being able to vent their anger at their mahouts or anyone who get in their way! Walking around the 'aanathavalam' as it is called in local parlance I was not sure how to react. This was a sanctuary for elephants but the gentle giants spend most of their time tethered by their feet in uncomfortable positions. Food was in plenty but the sight of the the palm leaves mixed with the mud, urine and dung is not for people with queasy tummies! I've lived a major part of my life in hostels, from kindergarten to undergraduate days. I've seen many types of hostels but this is unique. One part of me feels happy for the old pachyderms that are being cared for. The are fed and looked after well, and will be till the last day of their lives. At the same time I feel a twinge of pity for these majestic creatures; tied down among mounds of dung and sometimes in the sweltering heat. I guess if taking care of one elephant is difficult it will be difficult to care for more than 50 of them. The Devaswom is doing a commendable job but I wish it could be improved. that was one of my childhood haunts thanks for the feature.looking forward to more.